In this topic you will learn how to monitor the social performance of your videos using Brightcove Social. Dashboard - Provides a high level overview of video performance on social media accounts. Covered in this topic. Social Engagement - Provides an overview of the social engagement (Likes, Shares, Retweets, etc.) for videos shared to social media accounts. For information, see Reviewing Social Engagement Analytics. Start by selecting a time span. To select a report, click a tab at the top of the page. The dashboard is displayed by default. To specify the time period for the reports, you can click on a quick date or use the calendar control. Social analytics data always uses the GMT time zone. Click on a quick date to update the report. 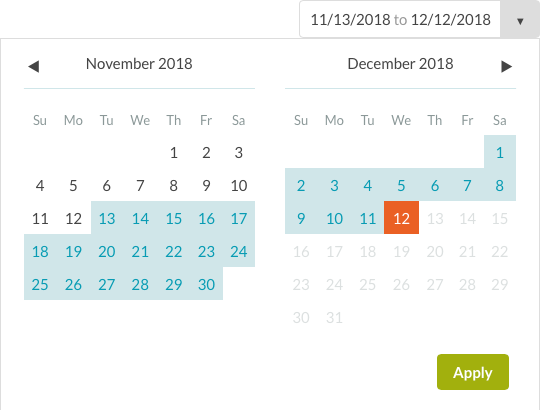 You can also select a start and end date by clicking on the calendar control. Click Apply to update the report. 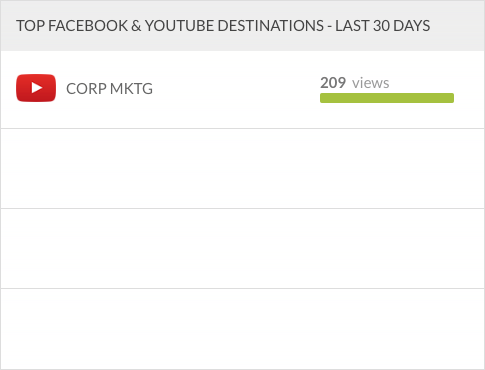 The Video Views at a Glance section will display the number of video views from Video Cloud players, Facebook, YouTube and total views for the time period selected. The Updated date is the latest date that Video Cloud has social analytics data for. Typically, there is a 24-48+ hour delay before social platforms update the views and engagement data in their APIs. Note: The Twitter Insights APIs don't report media views therefore viewing data is not available as part of the social analytics. Clicking on the MY SITES & APPS link will open the Video Cloud Analytics Performance Report. The Top Destinations section will display the top 5 destinations that had the most views for the time period selected. 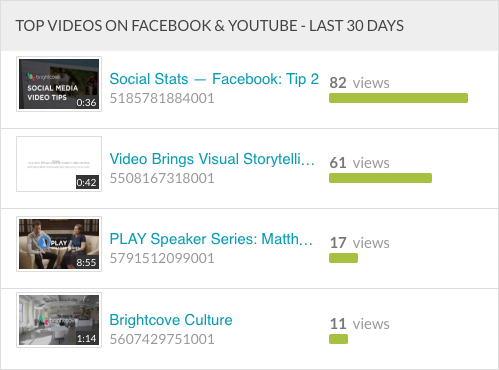 Clicking on the video title will open the social views analytics for that video. The Top Videos section will display the top 5 videos with the most views for the time period selected. The Video Views Trend graph will display the number of video views for the videos posted to your social media accounts for the time period selected. Hovering over a line in the graph will display the data for that date. How social analytics appear for deleted videos depends on how the video was distributed, and, if the video was AutoSync'd, what the AutoSync settings were. If the 'Delete distributed video on <social platform>' option was selected, then the Social module would have removed the video from the social platform and would stop trying to collect analytics data. If any of the options that leave the video on the social platform (exact details of these options vary from platform to platform) were chosen, then the Social module will continue to attempt to collect analytics for it.